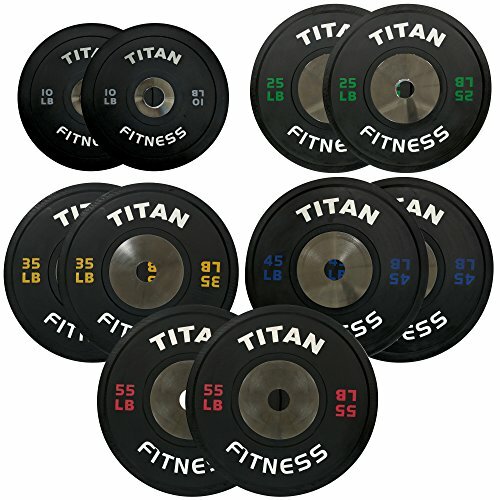 Titan Elite Olympic Bumper Plates are the answer for competition bumper plates at the right price. A Durometer rating of 90 hits the sweet spot for minimal bounce and maximum durability. The plates stand up to high reps and intense workouts. The narrow plate thickness allows room for multiple plates per side. Reinforced steel collar make for a secure fit -- meaning decreased wear on your equipment. A must have for high intensity circuit training and Olympic lifting at home or for your box. - Color-coded lettering with 5 vibrant colors for easy identification. - Steel collar reinforces the plates for high rep use. - Raised plate lip makes picking up the plates easier. - Plate Width: 1" - 2.5"
- Color: 10 LB (Black/Grey), 25 LB (Black/Green), 35 LB (Black/Yellow), 45 LB (Black/Blue), and 55 LB (Black/Red). Color-coded lettering with 5 vibrant colors for easy identification. Plate Width: 1" - 2.5"
Ivanko E-Z Lift Cast Iron Olympic Plates with Holes - 45 lb. pair for use with Olympic Weightlifting Bars. Hi-Temp Heavy Duty Rubber Bumper Olympic Weight Plates 260 lb.